Peter Pan – J.M. Barrie: This extremely pretty illustrated interactive edition has been on my wishlish for quite a while and I’m super happy Crini, Eva, Jana, Ellie, Nicole and Steffi gave it to me for my birthday. Thank you so much, guys! The Surgeon – Tess Gerritsen: I’ve already read this book as an ebook a few years ago but never continued the Rizzoli & Isles series afterwards, now I’m planning to finally tackle it and got the first as a physical copy for my re-read. Fool Me Once – Harlan Coben: Even though Harlan Coben’s books are often quite similar I just never get tired of reading them, that’s why I’m already excited to read his newest thriller! Tales of the Peculiar – Ransom Riggs: The „Miss Peregrine’s Home for Peculiar Children“ movie came out in October and made me want to finally finish the book series and so I’m glad my sister gave me this story collection about the peculiars. The Hatching – Ezekiel Boone: I’m always looking out for good and scary horror novels (which is harder than you might think) and even though I’m not especially afraid of spiders I have quite high hopes in this one. The Fever Code – James Dashner: I was super disappointed by the „The Kill Order“ prequel to the Maze Runner series and I hope that James Dashner did a much better job with this second prequel. Snowblind – Ragnar Jónasson: Since my trip to Iceland last year I’ve been wanting to read more books set in this country besides all the Yrsa Sigurdardottir novels and since I found a signed copy of „Snowblind“ I couldn’t resist this one any longer. DNA – Yrsa Sigurðardóttir: Talking about Icelandic novels here – comes another one! I’ve been a fan of this author since reading her creepy ghost story „I Remember You“ and pretty excited for this start of a new crime series. Mr. Sapien träumt vom Menschsein – Ariel S. Winter: a story where the protagonist is a depressive robot who’s trying to solve a mystery in a world full of androids? Count me in! The Secret History of Twin Peaks – Mark Frost: I’m getting closer to the end of season 2 of „Twin Peaks“ and because I love all these weird mysteries I couldn’t resist this companion novel that is set between the old episodes and the new ones airing next year. Also the concept of this book is super interesting and it looks really cool with all the documents, reports, newspaper articles, interviews etc.! Gemina – Amie Kaufman, Jay Kristoff: „Illuminae“ was one of my favorite books in 2015, so of course I had to get the sequel as well. I’ve heard mixed things about it but I’m nonetheless super excited to finally read this! 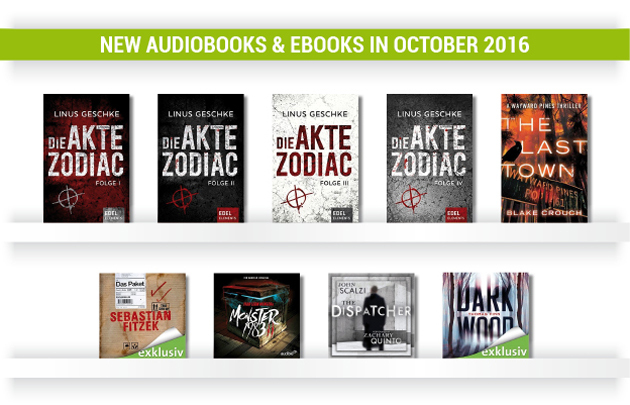 Die Akte Zodiac – Linus Geschke: I can’t help being fascinated by unsolved real serial killer cases so when I got asked if I wanted to get review copies of this eBook series that was inspired by the Zodiac murders I just couldn’t say „no“ – and I’m really enjoying it so far! The Last Town – Blake Crouch: It’s been a while since I’ve read the first two books in the Wayward Pines series but reading „Dark Matter“ and watching „Twin Peaks“ made me want to go back to this mysterious village again, so I was happy when I found the conclusion to this trilogy at a reduced price last month. Das Paket – Sebastian Fitzek: Fitzek was once one of my favorite authors but I’ve been disappointed by some of his latest books lately, nonetheless I just can’t let it go, so of course I had to get his new thriller as well – and spoiler: it’s good! Monster 1983 – Season 2: This has been one of my most anticipated audiobooks of the whole year – season 1 of this audio drama series was absolutely amazing and I have such high hopes for season 2. If you like the Netflix show „Stranger Things“, make sure you don’t miss this – it’s even available in English now! The Dispatcher – John Scalzi: I haven’t read anything by John Scalzi so far even though „Lock In“ has been on my wishlist for quite a while, so why not give this author a try with this free novella narrated by Zachary Quinto? Dark Wood – Thomas Finn: As I already said above I’m always trying to find good horror stories and since I’ve already enjoyed „Aquarius“ by this German author I hope this thriller won’t disappoint either. Have you already read any of these books? 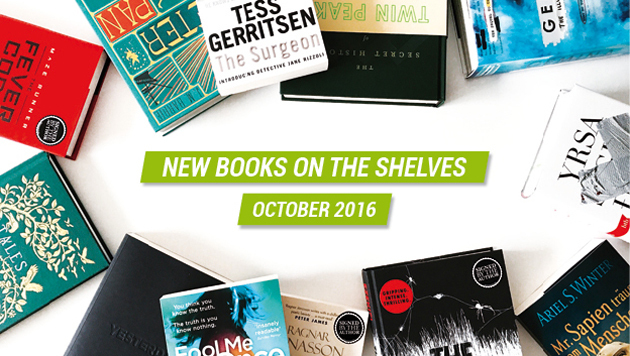 Which books did you get last month? Yay, so many books. \o/ I really like the picture of all of them at the top. I think Yesterday is the only physical book I got last month, and then of course there are always ebooks and audiobooks. I’m still disappointed that I can’t find „DNA“ here. I haven’t looked for Mr. Sapien träumt vom Menschsein yet, but your description of it sounds pretty interesting! Oh, you know, I think I did check, and my library has a physical copy. I’ll go double check and put it on hold!